SO as of late I have replaced all of my bulbs in the Coupe with LED's to include tail lights and headlights and front parking lights/turn signal indicators. The only problem I have been having is that the turn signals don't blink when activated. 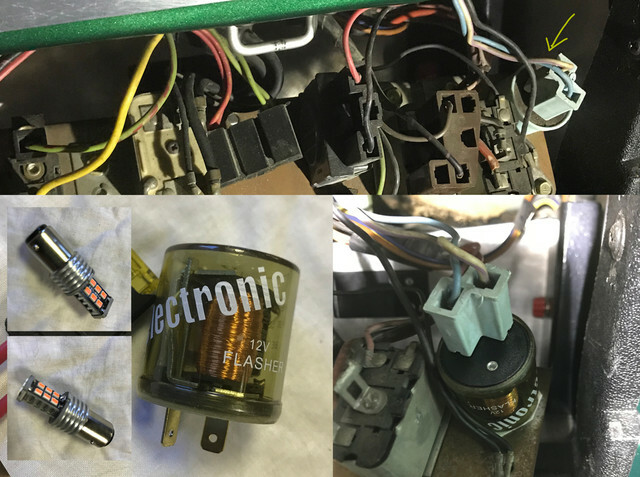 I did some research and purchased the resistor kits that are spliced into the ground and turn signal indicator wire on the back of the bulb housings. That was easy and I installed an LED flasher. The only problem is that when I went to turn on the turn signals, my column started smoking and they did not work as suggested that they would. I took apart the column and tested all of the leads on the turn signal switch which lead to finding some burnt plastic on the exterior portion of the wiring housing next to one of the lines, tested the line to find it had no power going to it, don't remember exactly which one it was, but had the schematics while doing the testing. Easy day, found the problem, know what I need to do as a next step. I replaced my windshield wiper motor a fe days ago and am going to replace the switch to it as well as it is not functioning properly. This morning as I was driving to work (only a block from the house thankfully) I turned on my wipers and it killed all electrical systems in my and could not restart it. Thankfully I have more than one vehicle available to use, but now I am at a loss as to what the hell the problem is. After work I tested the battery, it is good, then moved on to the starter solenoid and it is good as well. I have a feeling that my issue is under my dash, but I don't feel like messing with it today. Any thoughts or input? This may not be the source of your problem but in my case i installed a new electronic flasher and worked well without the resistor kit. My understanding is that the resistor kit is needed if you wanted to use the original flasher. Where did you install the resistors? Also. If you lost all the power check the battery cables. Did that too, no need for resistors (that can get pretty hot) and its plug&play. Do you need change the hazard relay also? What happens when you put hazard on and you have leds? Asking because I am planning to use leds also on my pony. When I was busy with this went looking for principles to get how this actually works, as I was reading different kinds of recommendations for flashers. The original flashers use a bimetallic strip (or wire) as contact . When power or enough current go thru they heat up. The diff in metal properties make one side of the strip expend quicker than the other side and the strip bends, breaking the contact. No current goes thru, it cools down and regain its shape and makes contact again. Depending on metal or strip thickness, this defines the delay between the on/off and the load required to bend. The LEDs draw much less current, not enough to heat up the strip, thats why your turn signal will stay on and will not blink. Or may be blink once every while if you still have a few incandescent bulbs in the circuit. There are tons of links on the subject, here's one. if you need buy flashers, there are diffs, some are made for full LED and some for mixed LED and incandescent. (07-18-2018, 06:36 AM)Fabrice Wrote: Same. Thanks! Luckily I am electrician so I get all that but never bothered read about it. I have full set of LEDs waiting, only missing LED headlights. (07-18-2018, 05:09 AM)DerAlte Wrote: Do you need change the hazard relay also? What happens when you put hazard on and you have leds? Yes, you need to replace the turn signal and the hazards flasher. It appears unavailable in Amazon but search for "EF32RLNP" in ebay and you should find it. For some reason the flasher prongs in our cars have the reversed polarity so normal flashers won't work. This one is polarity independent and would work. You can get a typical flasher and tinker with the prongs to swap them. I did this with the first one I bought so I had to swap and resolder the prongs. For the hazards I just bought the one in the link and it was as easy as plug and play. I know that this is a bit late, but if anyone is curious the problem ended up being the windshield wiper switch. When i turned it on the switch completely came apart and shorted out. The reason that the car would not restart is because I forgot that I had installed an inline 30 amp fuse that blew when the switch shorted out. Replaced the switch and the fuse, started right up. Also replaced the flashers with some electronic ones that have a ground cable, also replaced the turn signal switch again and have not had a problem since. Everything works and life has been great with the car electrically.